The more observant amongst you may have noticed that it is a couple of weeks since I have posted anything – there is a reason…. The morning of Tuesday 20 January was a cold one, it had taken an age to scrape the frost off the car and I had wrapped up warm with several layers. I pressed the button on the pelican crossing opposite work at around 7:55 and waited for the lights to change, as the pedestrian phase started I looked up the road, there was a car a little way away to my right and the traffic from the left had gone from barely moving to stationary, although I noticed someone getting into the cab of a lorry in front of me. A couple of seconds into the pedestrian ‘phase’ I started crossing….the next thing I was aware of was an NHS employee called Neil wearing a dayglo police jacket bought from EBay getting me into the recovery position and constantly talking to me – I’d been hit by a car whose driver who had failed to stop at the red light, I’d hit the windscreen with my head and had ‘bounced’ to the side of the road landing on my heavily padded shoulder. The ambulance seemed to take an age to arrive in the rush hour traffic, but once there, the paramedics carefully got me under cover, and after realising that I wasn’t in any immediate danger stabilised me before taking me to Accident and Emergency – I had hoped it would be to Lewisham – my local hospital – which local campaigns had saved from Jeremy Hunt’s desire to take out its heart by the closure of maternity and A&E. 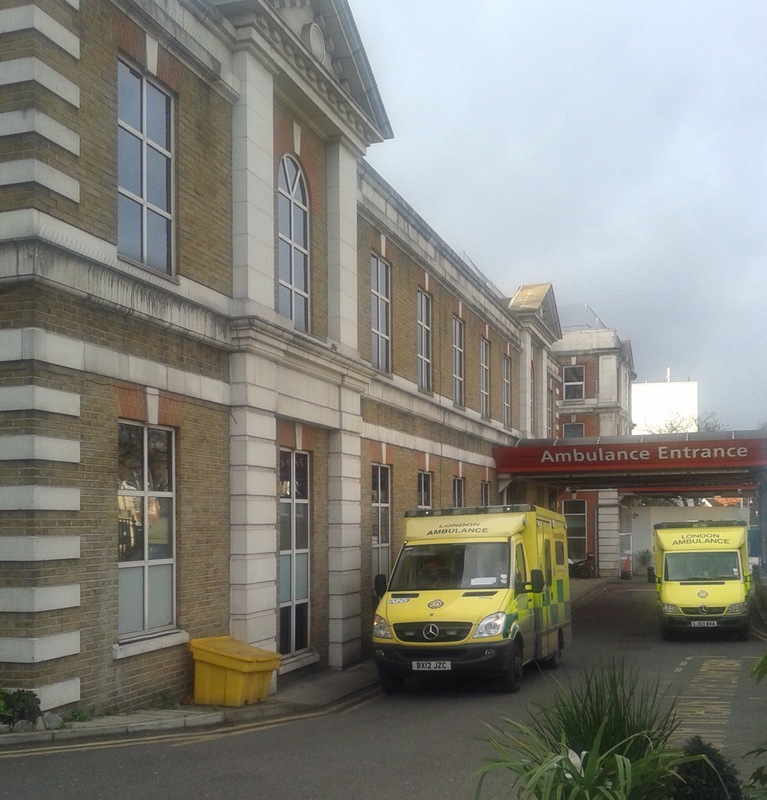 It was towards King’s College Hospital in the morning rush hour that the blue flashing lights headed – the neck pain meant I was an emergency neurological patient and was going to one of the best centres in the country. I was code name ‘Alpha Red’, which I rather liked. Quickly and methodically the team in A&E cut off my clothes and painstakingly, carefully and gently probed every bit of my body to work out what might be injured so that I could be scanned and x-rayed. This took several hours but confirmed a small crack in a vertebra in my neck, plus some heavy bruising to my shoulders. My neck was encased in a brace to try to stop any more movement. My ‘home’ for the next 9 days was Kinnier-Wilson ward, named after a former Professor of Neurology at the teaching hospital. The doctors under Nick Thomas were incredibly thorough in planning the next move – they wanted to make sure whether the break was stable, it wasn’t, and so with an operation needed scanned me for the best way to repair the damage with a plate. I cannot express enough gratitude to those who have repaired me, nursed me and cared for me – they were universally fantastic a credit to themselves and their hospital. A few deserve special mentions – Ara, who on my days in greatest pain proactively checked on whether I needed more pain relief and that, when given, it was working; Steph who stayed late to check that the operation had been a success when I came up from theatre after the end of her shift; Jiss who helped me to get mobile on day 2, showering me and sharing my joy of full, if painful, limb movement; Fathira, who had had a similar operation, reassured me about what I should expect, made sure that I had enough to eat after the operation, despite the kitchen being closed and shared my elation in the success of the operation; and Jeremy (from Murray Falconer Ward, where I spent my final night at King’s) who was there when I needed something rather unpleasant to be administered when I was struggling with the side-effects of one of the pain-killers but did it with so much care and then kept checking on me. I paid much more attention to Labour’s new health strategy which was announced whilst I was in King’s, it promised an end to privatisation and fragmentation in the health service, along with a better integration of health and care. I am no health expert, but It seems the right sort of approach for the future. The fantastic service I received from King’s was provided free at the point of use and almost entirely by directly employed NHS staff – it is how it should be. The bits like the cleaning and television service that were provided by the private sector, failed miserably and seemed horribly out of kilter with the ethos of public service that imbued the rest of the King’s service – a cleaner knocked over a urine bottle waiting to be moved on my beside table but would only clean the drips in the floor – the flooded table was ‘the nurses’ job’. The legacy of the likes of Aneurin Bevin and, more locally, Alfred Salter, have to be protected, patient care will always come second to the shareholders in privatisation. The politicians who want to stop or considerably reduce immigration should reflect on the make-up of staff in inner London hospitals. Of those who looked after me and who went out of their way for me, no more than a handful would have been able to tick the ‘White British’ ‘box’ in a census. 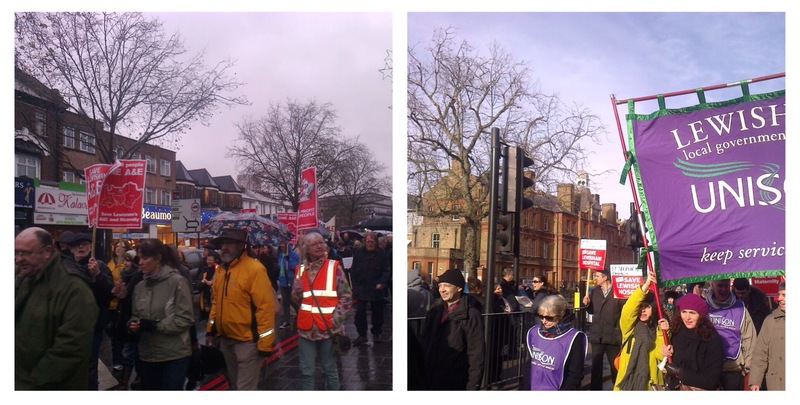 Our National Health Service depends on them, and is a better place for it. I am back home but still rather battered and bruised but, given what happened, consider myself very lucky indeed. Once the car hit me on the crossing many of the outcomes would have been terrible – death, permanent physical disability or brain damage. While I am still in pain, I know that I will get better; my current reduced mobility is frustrating but I know that it will improve and, perhaps, in a couple of months or so I will be putting back on my running shoes and heading towards Blackheath. It will be a frustrating few months and much of the rest of the year will be spent just recovering lost fitness – but at 8:00 am on Tuesday 20 January I would have been overjoyed with this outcome and I still am. This entry was posted in Running and tagged King's College Hospital, No to Privatisation on January 31, 2015 by Paul B.
Wow, sounds like you’ve been through a hell of a lot, and a very direct experience of the value of the NHS! So glad to hear you are on the mend, and hope your recovery continues at the same rate. Thank you – it has been a bad 10 days or so, but could have been so much worse and I have been completely overwhelmed by the care I have received. The NHS is one of the things that makes our country special. My goodness, what an experience. It is great that you are on the mend and things are looking up. It’s hard to say for me what is right and what is wrong, but that care would have cost you $100,000 in the US and if you didn’t have insurance it would hang over you for the rest of your life. Thanks. I had a similar conversation about what would have happened in the US with an American friend who visited me in hospital. Funding through taxation and free at the point of delivery is what makes the National Health Service fantastic – it doesn’t matter whether you are rich or poor, it is all about what your health needs are. Health first, running, fitness and all the rest will follow. Get well, my friend. Sometimes an unplanned rest (maybe not being run over by a car) is a blessing in disguise. Last year I was bummed to be sidelined for four months after a slip on the ice and one year later I ran my first ultra, so there is hope. Be well, my friend, and I look forward to your continued interesting posts. Wise words Jim. It is going to be frustrating, knowing the races and training I had planned – next Saturday will be the first time for this as I was due to be doing a cross country race. However, that I can even be thinking about running, even if it is months off, is a real plus given a lot of the possible outcomes to the accident. Sorry to hear about this and best wishes for a speedy recovery. The NHS is an incredible institution. My daughter was born with a hole in the heart which was treated wonderfully. She is now 12 and about to go for her 2 year check up with the same doctor who performed her original op. Thank you. You are right and it is something that I have reflected on a lot, because for all its imperfections the NHS remains largely free at the point of use, paid for by those who can afford it most through taxation. It is far, far better than any of the alternatives based on insurance and should never be a place for the private sector making a quick buck. The recovery is going well, but there is still a long way to go. Good lord! It sounds like you’ve been both very lucky and unlucky. Hope you are continuing to recover and as said before – thank goodness for the NHS. I tend to see it as very lucky, both in terms of still being around and not having any life changing injuries but it has led to me reflecting a lot about the positive things in life but seeing so much almost as new. The NHS in an emergency is unbelievably fantastic, as are so many of the staff. I’ve only just seen this. I’m so sorry that you had the accident and what a relief that you’re OK. Great to hear that you’ve had such care from the NHS – we must stop it being privatised. Hope you make a full recovery soon. I look forward to reading your posts. Thank you. 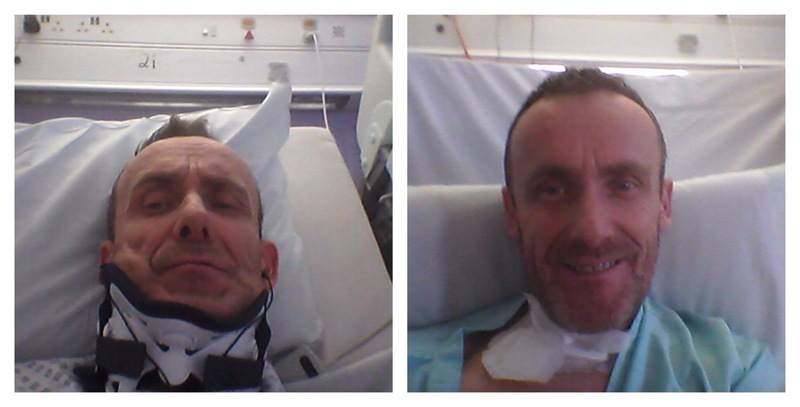 I am well on the road to recovery, I have most of the movement in my neck back now, am not really in pain and have started back at work – a mixture of home and office. I am not driving or running but enjoying the the fact that I can enjoy life still. 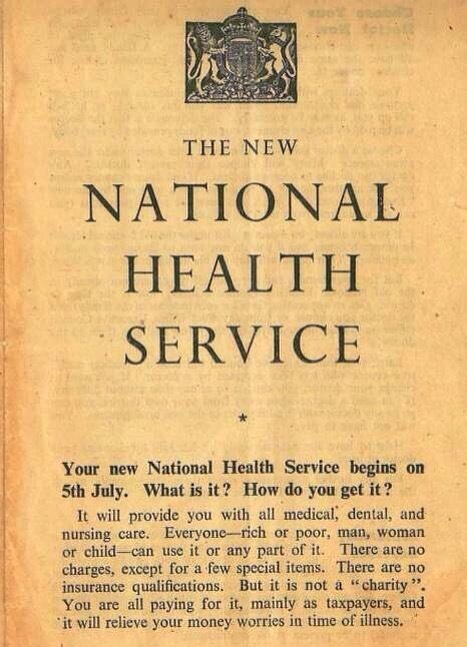 I still look back in the days in Kings with thanks of what the founders of the NHS achieved and worry intensely about its future if there is no change of government. Thanks again for your kind words.